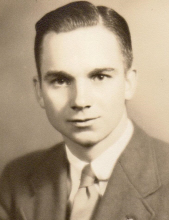 Kenneth “Wayne” Cruitt, 91, of Shelbyville, IL, formerly of Findlay, IL, passed from this earthly life on Tuesday, February 5, 2019 at 1:37 a.m. at the Shelbyville Manor in Shelbyville, IL. Wayne was born April 10, 1927, in Shelby County, the son of Leverett and Lucille (Banks) Cruit. He was a United States Navy Veteran and retired from farming after 50 years. He was a long-time member of the Findlay First Christian Church, the Findlay American Legion Post #409 and served on the Findlay School Board for many years. He loved antiquing, Civil War and Revolutionary War Reenactments and collecting marbles. At its largest, his collection exceeded half a million marbles. Wayne is survived by three sons: David (Nancy) Cruitt of Shelbyville, Stan Cruitt of Winston-Salem, NC and Don (Karen) Cruitt of Sunrise, FL; three daughters: Leanne (Tom) Blackburn of New Braunfels, TX, Pam (Jeff) Perry of Marshall and Angie (Gale) Bricker of Findlay; sisters: Doris (Henry) Heiland and Alice (Cecil) Barr; 14 grandchildren and 27 great-grandchildren, soon to be 28. He was preceded in death by his parents, Leverett and Lucille; sisters: Mildred, Mary Lou and Ruby and brother, Harold. Funeral services will be held at 3:00 p.m. on Saturday, February 9, 2019 at Lockart-Green Funeral Home in Shelbyville with Pastor Ron Newman officiating. Burial will take place in Glenwood Cemetery with military rites by the Findlay American Legion Post #409. Visitation will be from 1:00 p.m. until the time of service at Lockart-Green Funeral Home in Shelbyville. In lieu of flowers, the family asks that a contribution in Wayne’s name be sent to the Findlay American Legion Post #409, 216 E S Second St., Findlay, IL 62534 or the Findlay First Christian Church, 101 S Wall St., Findlay, IL 62534. Family and friends are invited to light a candle or share a story in Wayne’s honor at www.lockartgreenfuneralhome.com. To send flowers or a remembrance gift to the family of Kenneth "Wayne" Cruitt, please visit our Tribute Store. "Email Address" would like to share the life celebration of Kenneth "Wayne" Cruitt. Click on the "link" to go to share a favorite memory or leave a condolence message for the family.